Injury news EPL/ Man United: Michael Carrick picks injury on international break Manchester United midfielder Michael Carrick has picked up an injury in an international game against Spain. Manchester United midfielder Michael Carrick has picked up an injury in an international game against Spain yesterday, as per the latest reports. England failed to score against the defending Champions and lost by two goals to nil, Mario Gaspar and Santi Cazorla scored the goals for Spain. It wasn't the best night for the English players, with players Adam Lallana, Kyle Walker and Fabian Delph all have been on the criticizing list since the final whiste. 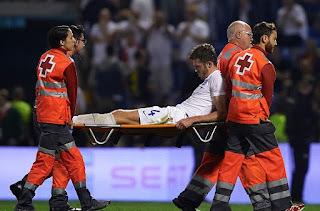 While the major bad news for both England and Manchester United is that midfielder Michael Carrick has picked up an ankle injury and he could be missing few weeks. The veteran was not upto his mark for the international side but he has been a vital player for the Red Devils.Boss Louis van Gaal will have to play few games without him. The 34-year-old midfielder has played 14 games for Man United so far this season. The Old Trafford side have experienced players who can replace Carrick in the upcoming games. Bastian Schweinsteiger and Morgan Schneiderlin both could be seen in the deeper midfield role together once again. The good news for the supporters is that the Red Devils have no big games coming in the next few weeks, however Premier League game against Leicester City would be a tough one but still not a big game.